The Richmond Oktoberfest needs volunteers !! 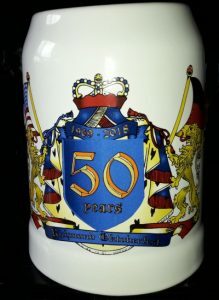 Want to know how to get this special edition 50th Anniversary Stein for free? Easy, by volunteering! Find out how! People who help at the Richmond Oktoberfest are not paid employees. We put on the whole event using only volunteers. However, we appreciate our helpers and we try our best to take care of them. We give all Volunteers a few perks as an expression of our gratitude for helping to make the Oktoberfest possible. Free Admission: Each Volunteer receives free admission on each day that he or she works. Pick up your admission ticket at the Workers’ Entrance to the Oktoberfest. If you work all of the shifts on either Friday or Saturday, you get free admission on the other day also. Free Beer Stein: Each Volunteer receives a free Richmond Oktoberfest Beer Stein, imported from Germany. Attached to your admission ticket will be a paper stub, which you pull off and take to the Beer stand, where you turn it in and receive your Beer Stein. If you work both days, your admission ticket for the second day will NOT have another beer stein stub. Free Food Tickets: We give Volunteers some food and beverages of their choice by giving them 15 food tickets (each worth $1 of food/beverages) for each shift that a Volunteer works. If you like the atmosphere at our Oktoberfest, we urge you to consider volunteering as helper. To volunteer, contact Hans Stienen at hans.stienen@comcast.net or (804) 451-4344.